After showing you a bunch of photos of the Collesi Brewery a few days ago, I thought I'd dig up a few more pieces of information about their beers and brewery. While my Italian is rusty, and assuming you're also in that same "no-speaky" boat, I think if you pay attention to these two videos you'll get a sense as to what they are talking about. From what I gather, the first video is one where Luca Sardella interviews Giuseppe Collesi and Roberto Bini about the different beers the brewery offers. Two Collesi models assist in pouring the and sampling the beers, perhaps ahead of some kind of exposition. The second video seems to be some kind of reception for a beauty pageant where Miss Italia and two other contestants (did he say Miss Argentina?) are drinking Collesi beers and apparently discovering how awesome they are, even over their beloved wine. Wish I were invited to that party! 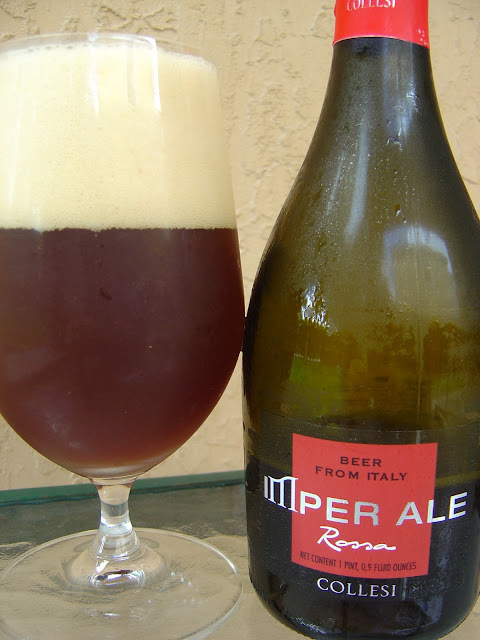 Today I'm drinking Rossa brewed by Birra Tenute Collesi SRL in Apecchio, Italy. This is the fourth of six varieties given to me by the American importer of this brand, and I thoroughly enjoyed their Chiara, Ambrata, and even moreso their Triplo Malto so far. Rossa is the style with the red matching label and neck color scheme. The story on the back talks of "a beer with a great personality". Packaging is very nice, size 500 mL. Big fluffy head. Cotton candy and Belgian yeast aroma with some persistent cherries and apples in the background. Malty flavors to start with a spicy little zing right up front. Caramel sweetness meets some apple and grape tart balance, surprising and interesting. Lightly acidic. Also complex with nuances of cherries and cotton candy--the components from the aroma switch places with the flavors in dominance--very fun. The 8% alcohol is noticeable, and definitely in a good way, keeping the malty sweetness under wraps. Carbonation is creamy and right on the mark. Very nice beer. Nice flavors. Complex. Nice aftertaste. Four winners in a row for Collesi!